Published: Jan. 20, 2019 at 10:06 p.m.
Kansas City Chiefs kicker Harrison Butker sends the game to overtime with a 39-yard field goal. Published: Jan. 20, 2019 at 09:47 p.m.
Kansas City Chiefs quarterback Patrick Mahomes launches it to wide receiver Sammy Watkins who scrambles for a 38 yard gain. 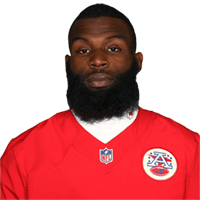 Published: Jan. 20, 2019 at 09:43 p.m.
Kansas City Chiefs running back Damien Williams cuts up the middle for a late go-ahead touchdown. Published: Jan. 20, 2019 at 09:20 p.m.
Kansas City Chiefs quarterback Patrick Mahomes hits running back Damien Williams on a throwback screen for the go-ahead TD.